Urb. Oliva Nova Golf S/N, 46780 Oliva, Spanje. Hotel with golf court on the beach in Valencia. Oliva Nova Golf Hotel is a full establishment as a part of a spectacular resort on the shores of Mediterranean Sea. 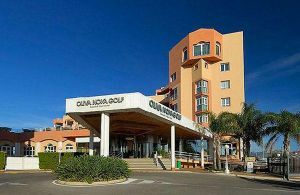 Oliva Nova Golf Hotel in located in Oliva, a village on the Valencia coast next to Gandia and Denia. The hotel has 242 suites, all of them exterior and with views over the sea or the golf court of the complex. Ideal for your holidays or business trips, the Oliva Nova Golf Hotel has a complete field of 18 holes, perfect for the lovers of this kind of sport, amateurs or professional ones. The hotel offers, among other services, a full spa and fitness center with indoor swimming pool, Jacuzzi, Finnish sauna or Turkish baths. 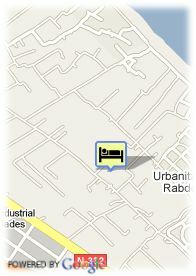 Moreover, the hotel has different sportive facilities, such as tennis courts and football pitch. For those liking a good meal, Oliva Nova Golf Hotel has three restaurants, specialized in regional, international and high cuisine. Ideal for your holidays, too, Oliva Nova Golf Hotel also offers seven lounges to hold reunions, conventions and professional events and having a capacity for until 300 people.